Mango Butter is extracted from the mango kernels. Mangoes are grown abundantly in tropical regions and are popular for their pulpy fruit, but their kernels do not find much use. It is from these kernels that a soft, rich and sweet smelling butter is extracted and is used in making soaps, skin care and hair care products. Mango Butter is similar to cocoa butter and shea butter in texture but different in terms of its fatty acids content. Let’s see what the constituents of the butter are and how your can use mango butter for hair and skin care. What does mango butter constitute? Mango butter is rich in antioxidants and Vitamins A, C and E. It has minerals like calcium, iron and magnesium. Not just this, mango butter is also rich in omega 6 fatty acids like stearic, oleic and linoleic acids which make it an excellent emollient. The butter has a sweet and nutty fragrance and is solid in room temperature. Rubbing it between your fingers or on the skin dissolves the butter and spreads it well all over the skin. You can apply natural mango butter directly on the scalp and the hair. Mango butter has a shelf life of upto 2 years when kept in a cool and dry place. You can also place it in the fridge and extend its shelf life for a couple of years more. 1. Mango Butter has a rich moisturizing effect that can help in restoring and maintaining the moisture levels in your scalp and hair. Apply it as a mask over your scalp and your hair and leave it on for about half an hour to one hour before shampooing your hair. This mango butter mask will make brittle and unhealthy hair softer and easier to manage. It also makes your hair healthy and shiny. 2. Its antioxidant properties promotes cell regeneration and makes your hair grow faster. The Vitamins A and C in mango butter also have a direct influence on improving your hair growth. 3. You can dab on some mango butter on your hair after shampooing it as a leave-in conditioner. It helps in shielding your hair against damage. 4. It is not very greasy so you can use it while styling your hair to make it more manageable. 5. Include some mango butter in along with your oil while giving yourself a hair massage to deep condition your hair. Simply melt some mango butter along with coconut oil, add a few drops of your favorite essential oil to it and get a soothing and relaxing hair massage that will give you lustrous hair. 1. Mango butter has rich moisturizing properties that will end all your dry skin woes. If you suffer from dry and flaky skin, simply rub some mango butter between your fingers and smooth it on your skin. This will instantly hydrate your skin. 2. Mango butter, when used over time on your knees and elbows helps you get rid of the coarseness of the skin. 3. 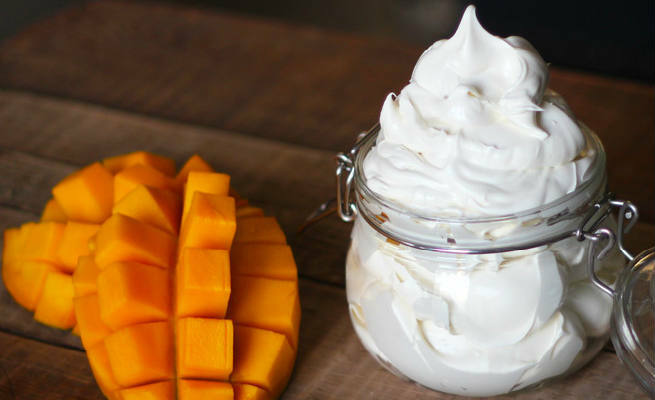 Mango butter can protect your skin from UV rays, eczema, rashes, insect bites and poison ivy. 4. Applying mango butter on your face and skin every night helps in the regeneration of cells in the skin and it keeps your youthfulness intact. 5. It can be used as a shaving cream. 6. Mango butter is a natural alternative to skin creams and body lotions – it does the job of moisturizing the skin better. It has regenerative properties that help in skin exfoliation and soothing sun damage. Would you have ever thought that the pit of one of your favorite fruits has so many benefits? Mango Butter is a one stop solution for most of your skin and hair care needs. Mango Butter can be purchased from many online stores in its pure form or in the form of soaps, body lotions and creams made from mango butter. While buying the pure butter, make sure that the product does not have any chemicals and makes use of organic and cold pressed mango butter. This will ensure that the butter is in its most natural form.